While the best way to lose weight is to eat less and exercise more, preliminary research shows that some supplements may have limited benefits for weight loss. White kidney bean extract is one of these, although it doesn't have the same benefits for everyone, and additional research is necessary to verify the potential beneficial effects. Taking white bean extract supplements 15 minutes before each meal led to a reduction in both weight and waist circumference compared to taking a placebo in a study published in The Journal of Applied Research in 2010. A few other studies have shown similar results, but further, longer-term research is necessary to verify these benefits and determine the most effective dose. One potential concern when people try to lose weight is how to maintain their lean body mass, or muscle, so that most of the weight lost consists of unwanted body fat. White bean extract may be able to help with this. A study published in the International Journal of Medical Sciences in 2007 found that people who took this supplement while eating a carbohydrate-rich diet lost more weight, and more of that weight came from body fat, than those who followed the same diet but took a placebo. To further minimize the loss of lean tissue, participate in both resistance training and cardiovascular exercise while trying to lose weight. Otherwise, about 25 percent of any weight you lose will come from lean muscle instead of fat. White bean extract may be helpful for weight loss because the beans produce substances that interfere with an enzyme called amylase that is necessary for the breakdown of carbohydrates, which are one of the main sources of calories in many diets. If carbohydrates aren't broken down into small enough units, your body can't absorb them and can't make use of the calories they provide. Absorbing fewer calories can help create the calorie deficit necessary for weight loss. Of course, this is most effective with complex carbohydrates, such as starches. Some sugars are already in small enough units that they can be readily absorbed by the intestines, so white bean extract wouldn't affect their absorption. Because white bean extract limits carbohydrate absorption, it will have the most weight-loss benefits for those who eat a diet high in carbohydrates. Those who follow a low-carb diet aren't likely to experience much of a benefit from this supplement. A study published in Alternative Therapies in 2007 found that taking white bean extract in conjunction with exercise and dietary changes resulted in the most weight-loss benefits in the group of study participants who ate the most carbohydrates. Simply taking white bean extract while still eating the same amount and type of food may not result in substantial weight loss. You'll need to watch the number of calories you consume as well. For each pound of weight loss, you'll need to create an energy deficit of 3,500 calories, so to lose a pound a week you need to either eat 500 fewer calories per day or burn the equivalent amount of calories by exercising more. To lose weight, you don't necessarily have to buy white bean extract. 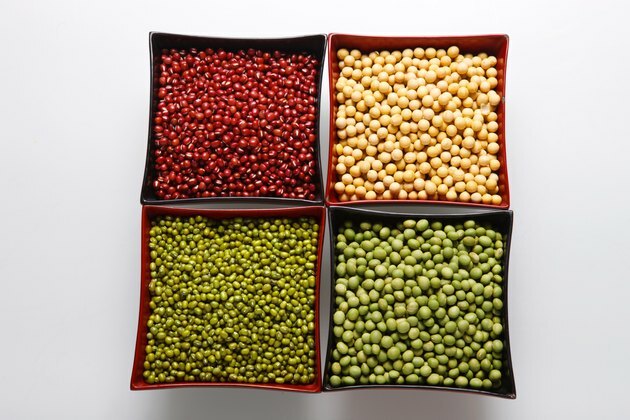 Eating legumes as part of a healthy diet may aid your weight loss efforts. A review article published in Advances in Nutrition in 2010 found that consuming dried beans, chickpeas, peas or lentils may help people increase satiety and weight-loss results, in part due to their high protein and fiber content and the slow-digesting carbohydrates they contain. The effects were greatest when people also reduced their calorie consumption. Replace a few meat-based meals with bean dishes and you may have an easier time losing weight, while still getting enough to eat that you feel full and satisfied. If you can't give up the meat in your meal entirely, try switching out half of the meat in a suitable recipe with beans. Is There a Chromium Picolinate Dosage for Weight Loss?